At the right of Resource panel is Component panel, which is a new area added in SWF Easy 6.0. Here list many components for you to add to your animation freely. What is component? A component is a movie clip with parameters. It can be a simple user interface control, such as a radio button or a check box, or it can contain content, such as a scroll pane; a component can also be non-visual, like the FocusManager that allows you to control which object receives focus in an application. Components are for developers who are building Flash applications and want to use components to speed development. In Sothink SWF Easy, using components is very easy. You just need to drag the components to the canvas and set their properties, parameters. events and methods in Properties panel.You can also add functionality to your applications and easily customize the look and feel of components to suit your design needs. 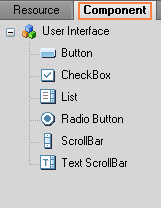 In version 6.0, there are 6 User Interface components added in. In next versions, Sothink SWF Easy will add more components of different types. If you want to learn more details of component, you may link to page Component Overview.